Minimalism, in one form or another, has been a popular approach to flooring in commercial spaces for a long time. In older buildings it’s commonplace to see everything stripped back to something quite neutral, taking advantage of features such as aged wood floorboards, white walls and perhaps some rough and ready brickwork. In newer buildings, a clean and modern look often works well with the architecture. Both routes tend to be quite cost effective. However, how we live and work is changing. The line between the two is becoming blurred, and workplaces are now designed to accommodate multiple activities. Desk working, formal meetings, informal discussion, breakouts and contemplation are all being catered for in office décor. Meanwhile, across retail and hospitality there’s a much wider recognition of how flooring can be used to define zones and influence consumer behaviour. 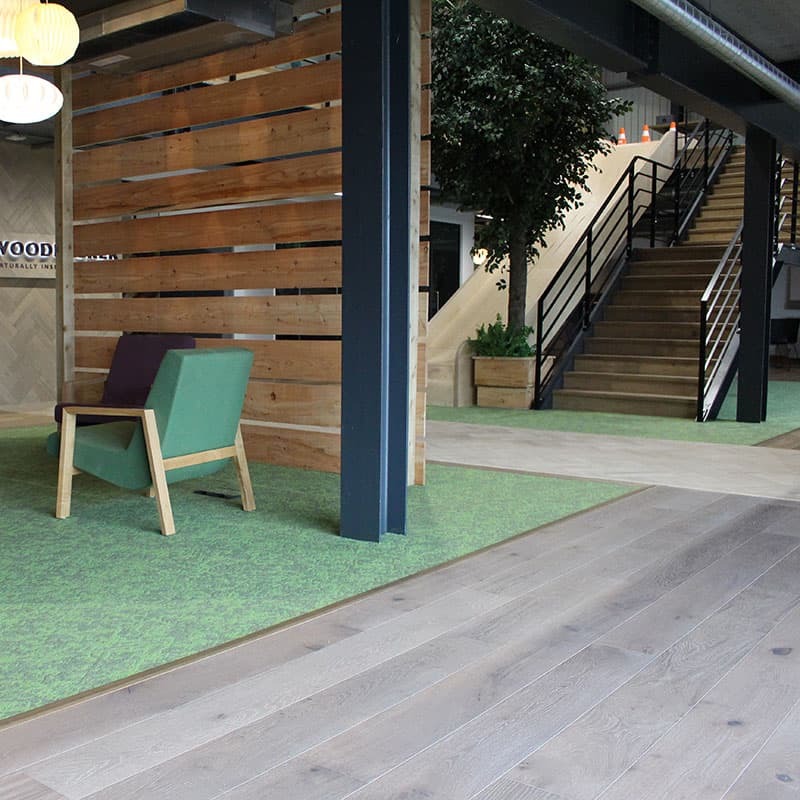 For many businesses, the days of specifying a single, basic type of flooring throughout a space are over. Customers, staff and visitors are much more conscious of the experiential side of commerce and pay more attention than ever to the look and feel a company conveys. To achieve this, a mix and match approach is called for and wood has a big role to play. 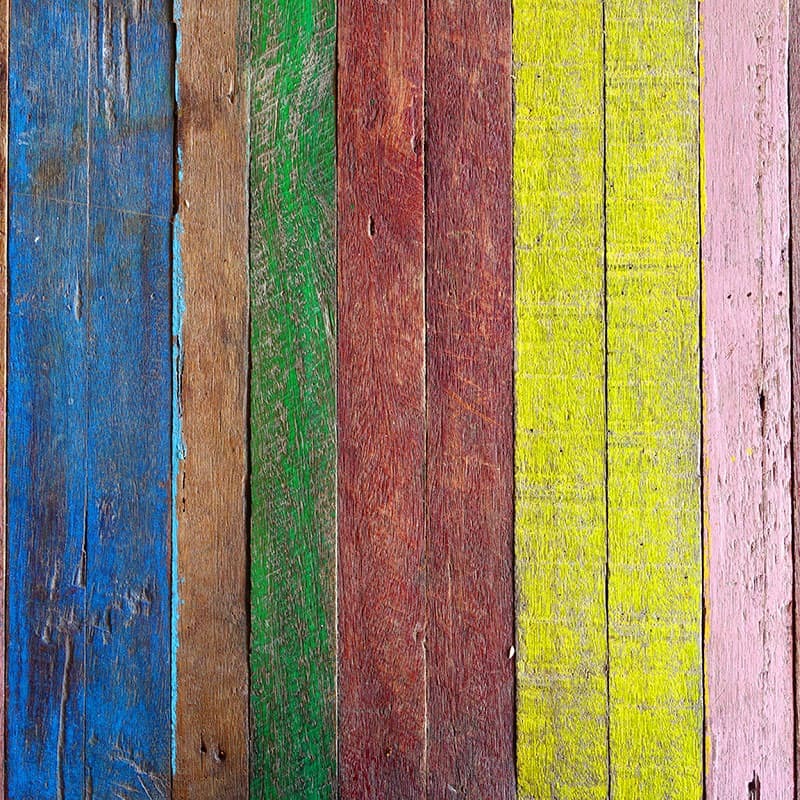 Bright colours aren’t normally associated with wood floorboards. 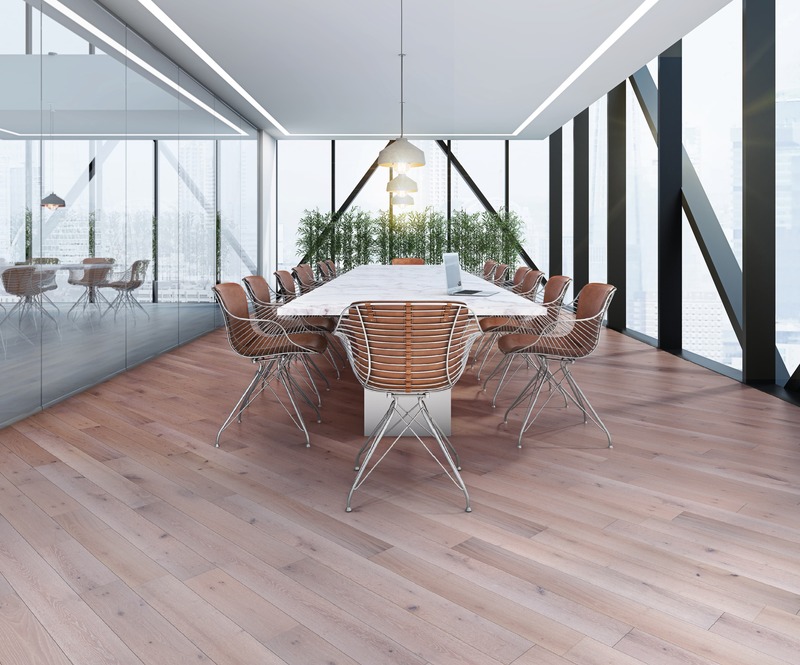 While nature offers a range of beautiful hues and textures, wood and stained wood can’t always match the pop that’s possible with synthetic luxury vinyl tiles, or boldly glazed ceramics. But don’t rule it out. Floorboards can be painted in any colour you wish to create a dynamic effect. With natural floorboards throughout the space and painted sections to give it that added zip, designers can have the best of both worlds. By using brand colours, the identity of a shop or company can be emphasised through this approach. Or, an exciting colour scheme that extends to the floor can aid with zoning or even the wayfinding system in a larger retail outlet. The general advice when laying a hardwood floor is to align the boards with the direction of the light. If the room is lit by a big window, the floorboards are normally set perpendicular to it so that they travel in the same direction as the light streaming in. To make a narrow room look wider, floorboards are typically laid horizontally across it, and to make a short room look longer they can be put down vertically. These are the ‘rules’ when it comes to installing floors, but why not break them to make a space feel different. Diagonal floorboards, laid at 45 degrees, deliver a touch of the unexpected. 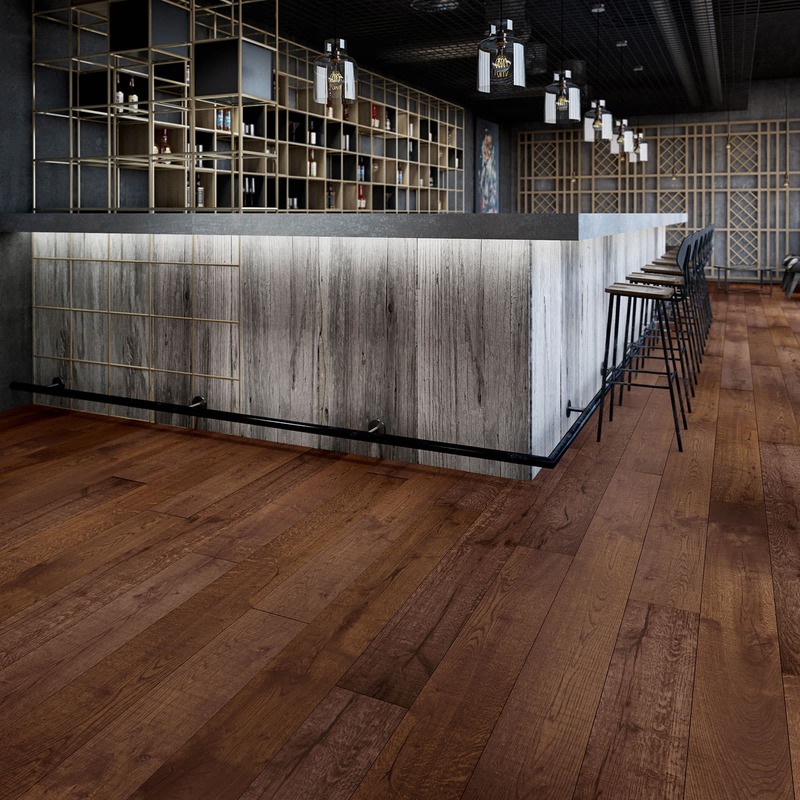 Just as wood textures are used to help break up the rigidity of the built environment with its straight lines and right angles, laying flooring in this way evokes a less ordered, more relaxed vibe. It’s a great idea for a creative work area, and can also help make a small room feel bigger. If laying floorboards diagonally seems a like a bold move, just think how popular patterns with diagonal lines are at the moment. 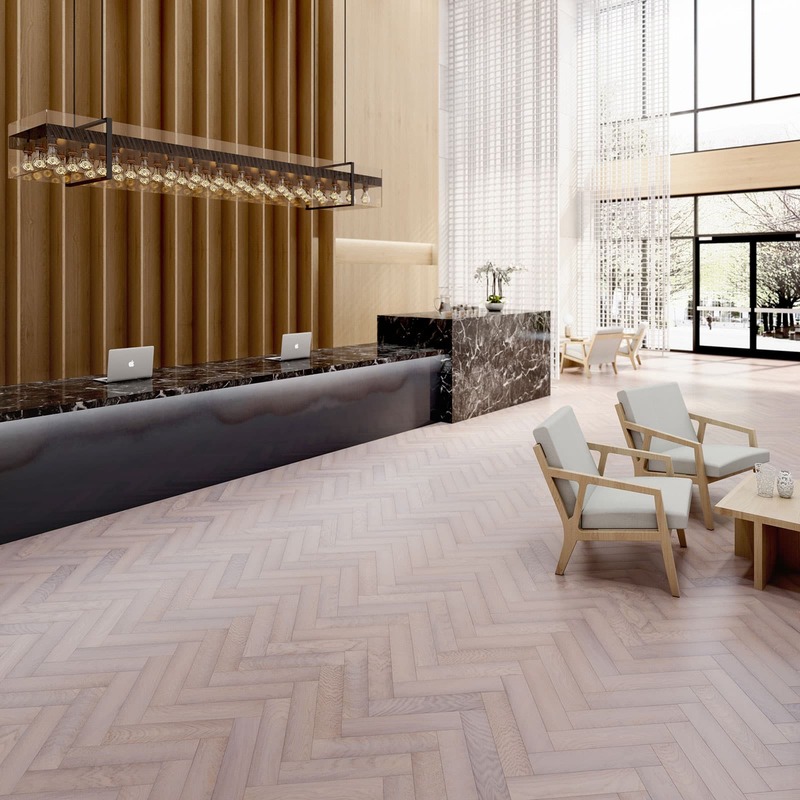 Herringbone parquet flooring is currently one of the biggest trends in décor and the zig-zag look it brings is not only elegant and sophisticated but it ties in, once again, with the mix and match vibe designers are using to make commercial spaces feel more exciting. The way the light plays across the pattern can really emphasise the wood’s natural grain texture, or its rough machined finish, depending on the type of floor selected. Patterns can help define the character of a space, and give it extra intrigue. 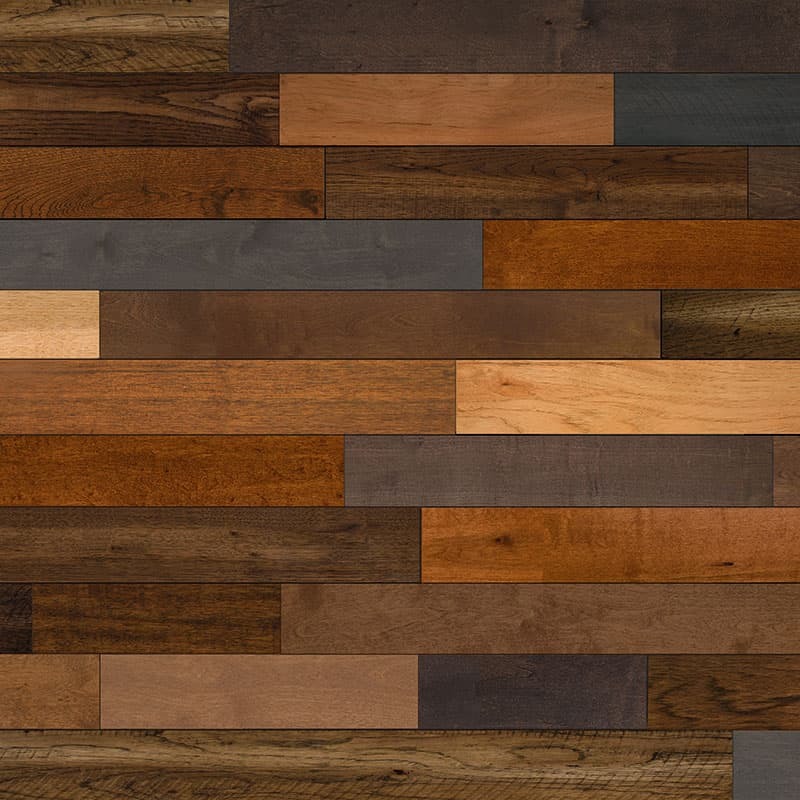 Not many interior designers would recommend floorboards made from wood of varying colours, unless that is, they want something really bold and original. Even if you carefully research and compare wood colours, the results are fascinating in their randomness. Dark and light woods side-by-side; richer and softer hues mixing things up – the overall effect can be truly stunning. Once again it seems as though the rules can be thrown out the window, although it might be a good idea to avoid mixing warm colours with colder, muted tones such as grey or ash. When purchasing, ensure the boards have compatible widths and that they fit together in the same way. For instance, click joint and tongue and groove flooring wouldn’t be compatible. For any business that wants to convey a sense of authenticity, natural materials and textures are an obvious choice. While plenty of luxury vinyl and ceramic tiles are available to mimic wood and stone finishes, there’s nothing like the real thing and bringing wood and stone together can be a winner. Slate, granite and marble look beautiful in combination with traditional hardwoods such as oak and walnut. A stone border with a metal inlay and wooden flooring offers the height of elegance. Matching or contrasting the colour of each material gives a range of options – a pale wood with marble suggests a light sense of optimism, while a deeper wood floor set against slate has a grounded, heritage feel. There might not be the pop or fizz that a brightly painted highlight brings, but natural materials and textures might just make a subtler and longer lasting impact.